Abstract: As anyone can plainly see, the Titan MT1AB5 is blessed with a lot of fins, but the effective use of airflow paths is what will really make the grade. Titan have yet to make a really strong impact in high performance cooling, but their designs are full of innovation and generally eye catching. The Titan MT1AB5 is a throw back to the days of the Golden Orb. Titan are attempting to improve on that now memorable design by rotating the entire contraption 90 degrees and adding another fan (one for intake, the other to help exhaust). As anyone can plainly see, the Titan MT1AB5 is blessed with a lot of fins, but the effective use of airflow paths is what will really make the grade. In this respect, Titan seem to have learned from old deficiencies. 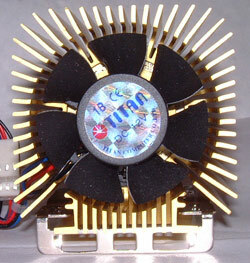 While both fans on the heatsink appear identical at first glance, that is not the case. 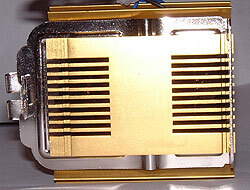 The first fan is used to pull air into the heatsink and push it out through the fins. The second fan has a reversed impeller so that it pulls air from within the fins and expels it outwards into the surrounding environment. So basically, one fan pulls in, the other pushes out. 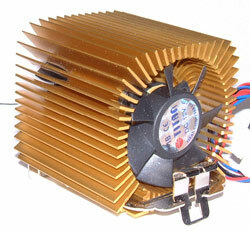 Fan Specs: (2X) 50mm fans, ~4500RPM, 12V, 0.16A. HS Material: Extruded Aluminum, anodized gold. The MT1AB5 is a little old now as it is only rated for 1.4GHz Athlon's, and AthlonXP 2100+ processors in addition to Intel's line up of socket 370 processors. The Fan: There are two of these fans, one with blades as shown, and the other with blades designed to pull in cool air. The three prong clipping mechanism is a real treat for a true OEM level cooler, but a Y-splitter will be needed as each fan has a separator power connector. Top: The top and sides all look just about the same, so we've included fewer pictures in this review for that reason. The fins are roughly 1mm thick, and spaced on the order of 2mm apart at the tips. 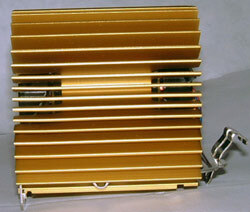 The central core of the heatsink is roughly 35mm thick. The clip is tool free, but only one side uses all three clips - the other just one. The base is a little bit rounded in places, and Titan have made some cross-cuts in an effort to move some air below and cool the core indirectly. The central portion of the base measures 20mm x 38mm.